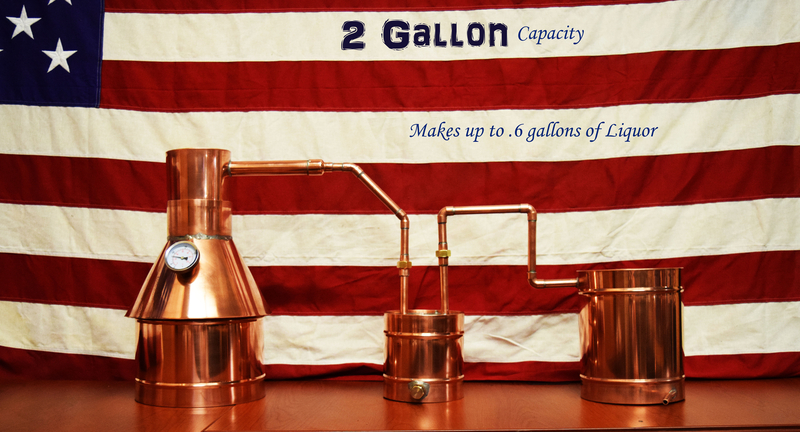 We specialize in the manufacturing and production of these 2 gallon all copper MOONSHINE STILLS which are handcrafted to perfection. Made using heavy gauge copper and lead free solder, our units are built to last. All of our units are water tested and have ZERO leaks. FREE SHIPPING!!! To the continental US. Hawaii and Alaska may be additional for shipping. Please contact us if you are from Hawaii or Alaska so we can go over shipping options. 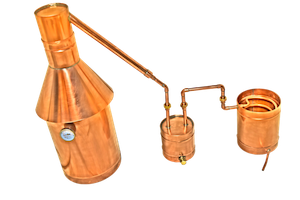 We have a custom, patented design which is a TRUE APPALACHIAN MOONSHINE STILL. Functional FOLK ART. Our stills are the best , we have a 7,000 sq foot facility in Manchester New Hampshire. The mill buildings along the Merrimack River have a deep cultural history within the American Industrial Revolution. What you are looking at here is a 2 gallon COPPER MOONSHINE STILL. Hand-crafted in the State of New Hampshire! This still is GUARANTEED to last. Built with lead-free, silver solder and 22 gauge (20 oz.) COPPER sheets,water soluble flux, lead-free brass fittings and as always, with PRIDE AND JOY from the Granite State of NEW HAMPSHIRE. This unit comes as a COMPLETE KIT which includes the POT, THUMPER and WORM. It also comes with a high-heat temperature gauge. ALL of our units are completely water tested and have ZERO LEAKS! Our stills are always cleaned and polished ,giving it an amazing appearance. This unit is not only FUNCTIONAL, but also doubles as a FINE piece of Artwork! All units are shipped in a safe and timely manner and include FREE SHIPPING!!! Call US anytime throughout the course of your purchase and WE will be able to answer any questions which may arise. We know there's alot of guys out there that want to sell you an expensive fancy still... well look at this. it gets the job done better! Our craftsmen are highly skilled in copper work. With the use of the thumper you really increase your proofs as well! The thumper also comes with a drain for the afficianiados that like to keep everything nice and clean and pure. Dont be fooled into buy a stainless steel unit! The copper works wonders on your product,a purer finish you will never be able to replicate in a stainless unit. The traditional style of my still will never get old. My units also break down and are easy to store in a garage or closet. Shipping Time: - 10 Days Shipping Please be patient while we complete your unit.